Citation Information: J Clin Invest. 2005;115(2):221-224. https://doi.org/10.1172/JCI24272. For 3 decades, terms such as synthetic phenotype and contractile phenotype have been used to imply the existence of a specific mechanism for smooth muscle cell (SMC) responses to injury. In this issue of the JCI, Hendrix et al. 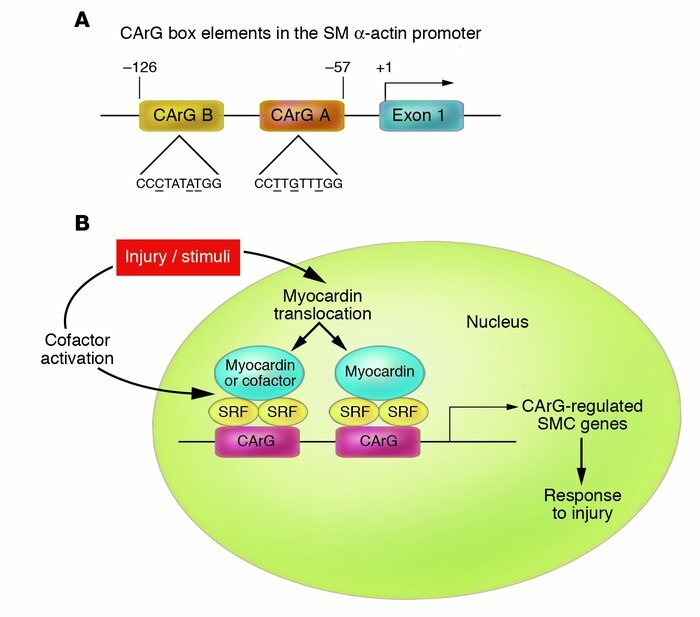 offer a far more precise approach to examining the mechanisms of SMC responses to injury, focused not on general changes in phenotype but on effects of injury on a single promoter element, the CArG [CC(A/T)6GG] box, in a single gene encoding smooth muscle (SM) α-actin. Since CArG box structures are present in some, but not all, SMC genes, these data suggest that we may be progressing toward establishing a systematic, molecular classification of both SMC subsets and the response of SMCs to different injuries. Regulation of CArG-specific SMC genes. (A) CArG box elements in the SM α-actin promoter. The SM α-actin promoter contains 2 consensus CArG boxes [CC(A/T)6GG]. However, the wild-type sequences are degenerate relative to the canonical sequence first identified in c-fos (CCATATTAGG). The positions of the specific nucleotide modulations are noted by underline. The other CArG-regulated SMC genes also contain multiple and degenerate CArG box elements. The number of consensus CArG boxes as well as their specific sequences varies from gene to gene. In addition, there are a number of SMC genes that do not contain CArG sequences, which suggests yet another mechanism for controlling gene expression in a gene- and stimulus-specific manner. (B) Molecular control of CArG-specific SMC genes. CArG boxes are bound by SRF. This protein-DNA complex is further regulated through interactions between SRF and specialized cofactors, including myocardin. Ultimately, CArG-specific SMC gene expression is controlled through these macromolecular complexes, which allows the SMC to respond to various stimuli, including injury.